There was nobody there holding my hand to walk me through the process of completely renovating my lifestyle, and I had to do a lot of the hard work by myself. During the first few months, I feared that I would always fall back on my cravings of meat, cheese, & eggs. There was also a strain on our finances, due to the fact that my husband was in school for his doctorate, which affected the groceries we could afford. Additionally, at the time we lived in the deep south of food culture which made the “vegan option” an exception to the rule. There never seemed to be enough time as I was running my own business and about to take on a new job, which left us at our wits end most days. I wanted to pull my hair out with everything I “couldn’t eat anymore,” what started to manifest itself as a “lack mentality.” My family and most of my friends, in the beginning, were not super supportive; and the community in which we lived provided many questions, comments, and disapproval for this radical transition I had decided to publicly taking on. That’s why I created Vegan School, the first official “NO BS” way for learning HOW TO go vegan without spending months (or years) in frustration trying to figure it all out for yourself. It’s FREE because I believe in this work, and I believe in the right for people to know the real information without the headache or money-sucking marketing schemes. This course is for people who are ready to make a change, but just don’t know where to start. Not only will this be the starting block for healthier habits but a healthier mindset about food & its relationship to the body. In less than 25 minutes, you will learn the best skills which are proven to have better health effects AND more positive environmental outcomes. This movement is so much bigger than what we eat. Our food decisions affect the entire planet’s well being as well. 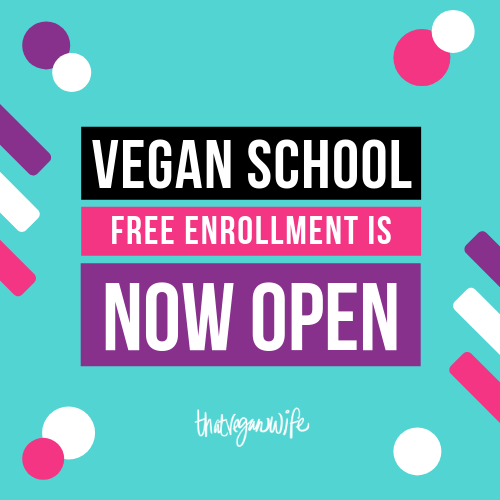 If you need something that gives solutions to better, healthier habits, which doesn’t cost an arm & a leg or tons of time, Vegan School is for you. 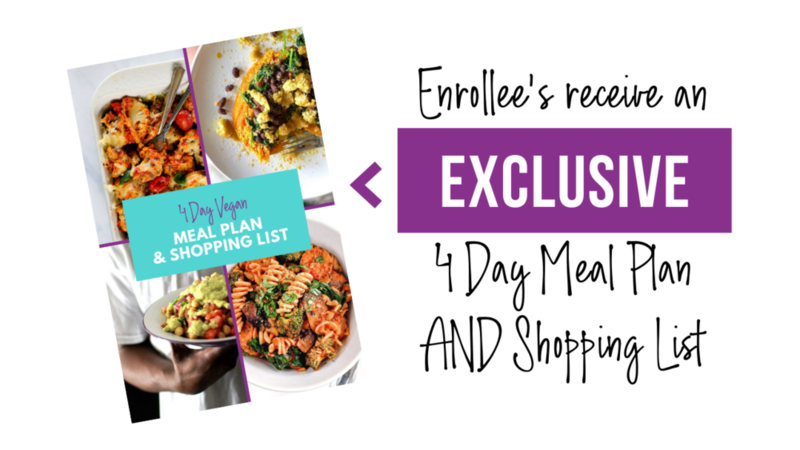 Not only will you be enrolling in the course material & receive a 4-day meal plan with shopping list, but you’ll gain access to an online community of “Veganners” where the hard questions are welcomed. There is nothing else out there like this! As I will elaborate in the beginning of the course video, I never expect perfectionism. We don’t need a few people doing this perfectly; we need a bunch of people trying to make the planet better, imperfectly. There is no “plan-et B,” so enroll in Vegan School now!. It’s risk-FREE. Enter your email address and receive free, lifetime access to this learn-able material via your email where I will walk you through how to actually succeed at this lifestyle renovation. I believe in you, now let’s do it. 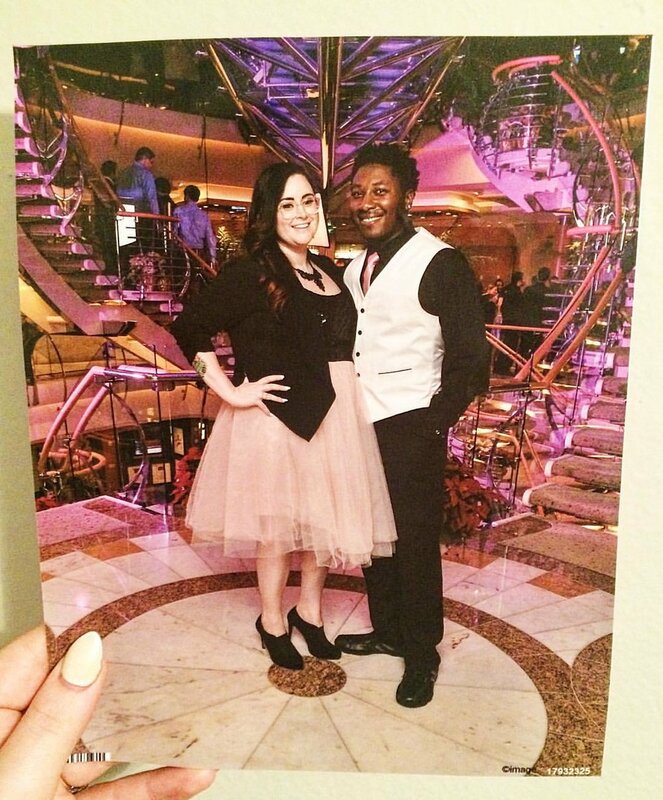 Right before the holiday season of 2015 was when I decided to go plantbased, and I had no one to help me. There was no one holding my hand telling me what kind of food to make or even how to season it; no one to tell me how to go grocery shopping at the local Wal-Mart; and no one explaining to me why this would actually work in regards to health changes. I had to figure this thing all by myself. It was challenging maneuvering going to restaurants & social gatherings, and I had no idea where to start when it came to recipes. I could go into the gory details of what went wrong during that first year, but that calls for another blog post. Another thing that really concerns me in our current health culture is the over-advertised, under-researched, conflicting health advice being given without warrant for people’s long term well being and sustainability. With experience in both “Corporate America” & Advertising Agency settings, I’ve learned the tricks that advertisers pull to gain customers, even if their product isn’t that good. Designing everything from billboards to online ads with high promises for financial gain, I’ve also learned that people fall for things pretty easily now days… and we, as humans, tend to make things hella complicated for no reason. Not all advertising is untrue, however, consumers have got to be more aware of how their decisions are making an impact on themselves as well as the world around them. That’s why I created the Realistic Holistic 6-Week Course. It’s a 'no fads, just food' experience open for those who are looking for simple, realistic solutions to improve their health and the health of their families. During our 6 weeks together, I will explain the simple tools of how to make a plant based meal plan, recipe suggestions, how to manage grocery shopping on a budget, as well as why plants are good for our bodies & minds! I also incorporate the double-blind, clinically researched whole food nutrition products by Juice Plus+. The Juice Plus+ products are what they say they are with evidence to back them up, and the phytonutrients within are sure to fill in the gaps of our bodies need from produce daily, making the transition to eating more plants easier. Designed with you in mind, the Realistic Holistic course has the tools you’ve been needing to make the health goals you’re wanting. Take note, that with any sort of health journey, things take TIME. Your body is not Amazon Prime, it’s not going to show up in 2 days. We’ve got to be gentle and loving with ourselves & those around us in the process, and I hope that the tools provided will make your dreams come true.